Skoropys-Yoltukhovsky, Oleksander [Скоропис-Йолтуховський, Олександер; Skoropys-Joltuxovs'kyj; pseudonyms: H. Budiak, L. Halin, O. Vyshnevsky], b 10 July 1880 in Straro-Khrystyshche, Olhopil county, Podilia gubernia, d 1950 in a Soviet labor camp in Mordovia. Revolutionary figure and civic leader; son-in-law of Yevhen Chykalenko. He joined the Revolutionary Ukrainian party (RUP) in 1901, became a member of its editorial committee in Lviv in 1903, and wrote one of its pamphlets (published 1904). 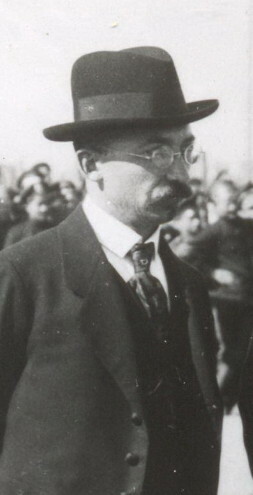 After the 1904–5 split in RUP he became one of the leaders of the Ukrainian Social Democratic Spilka. During the Revolution of 1905 he established a strong Spilka network that organized peasant disturbances in Kherson gubernia and Kyiv gubernia. He was arrested in September 1906 and imprisoned. In 1909 he escaped from exile in Siberia to Central Europe. 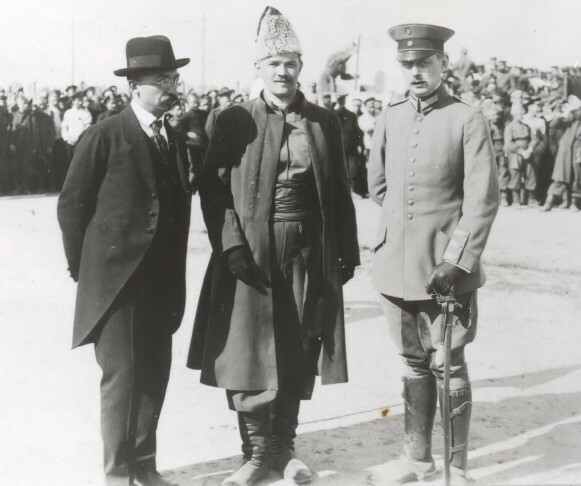 After the outbreak of the First World War he became a member of the presidia of the émigré Union for the Liberation of Ukraine (SVU, 1914–18) and the General Ukrainian Council in Vienna (1915–16). In 1915 he established the SVU Central Bureau in Berlin and became the leading SVU organizer in German prisoner of war camps. In February 1918 he negotiated at Brest-Litovsk (see Peace Treaty of Brest-Litovsk) the prisoners’ release and formation as the UNR Army’s Bluecoats divisions. From March 1918 he served as the commissioner of the Ukrainian National Republic and Hetman government’s starosta in the Entente-occupied Kholm region and Podlachia. He was arrested by the Poles in Brest and interned at Kalisz in December 1918. He was released in 1920 and lived thereafter in Berlin, where he became a leading member of the conservative monarchist Ukrainian Union of Agrarians-Statists. In 1926 he helped Pavlo Skoropadsky establish the Ukrainian Scientific Institute in Berlin and was appointed vice-chairman of its board of governors. Skoropys-Yoltukhovsky was arrested in 1945 after the Soviet occupation of Berlin, and perished in a Soviet concentration camp. He wrote political works, such as Na perelomi: Uvahy pro suchasni vidnosyny Rosiï (At the Turning Point: Observations on Contemporary Russian Relations, 1905) and Znachinnia samostiinoï Ukraïny dlia evropeis’koï rivnovahy (The Significance of an Independent Ukraine for European Stability, 1913); the afterword to the SVU 1917 edition of the first RUP pamphlet, Mykola Mikhnovsky’s Samostiina Ukraïna (Independent Ukraine); a booklet about Ukrainians in the prisoner of war camps (1918); and memoiristic articles about the RUP, the Spilka, and the SVU.